Aim : The purpose of this in vitro investigation was to evaluate the influence of double application and application of hydrophobic layer on marginal adaptation of four self-etch adhesive systems (XENOIII, ALLBONDSE, CLEARFIL SE TRI BOND, FUTURA BOND). Materials and Methods : One hundred and twenty class V cavities were prepared on intact, extracted human premolars and were divided into three groups of ten teeth each for all four adhesives. Group 1: Application of bonding agents as per manufacturer directions. Group 2: Double application of bonding agents. Group 3: Application of hydrophobic layer. The specimens were restored with composite and light cured. After thermocycling and immersion in 2% Basic Fuchsin dye solution, the teeth were sectioned and dye penetration was observed under a stereomicroscope at 20× magnification. All the samples were scored and results were analyzed using Kruskal-Wallis and Mann-Whitney tests. Results : Group 3, in which the adhesive systems were coated with hydrophobic layer, showed significantly decreased microleakage, followed by Group 1 and Group 2 for all the adhesive systems. And there is no significant different between Group 1 and Group 2. Conclusion : Marginal permeability of one-step adhesives can be minimized by the application of more hydrophobic resin layer, and the double application of one-step self-etch system can be safely performed without jeopardizing the performance of adhesives. As these materials have become popular among clinicians, they are being introduced at a very fast rate, without comprehensive testing to substantiate their performance. Although very simple in technique, studies show that these systems may not perform as well as two- step self- etching priming system and etch-and-rinse systems. This inferior performance has been attributed to certain factors. First, the etching pattern of self etch adhesives is not as well defined as that provided by phosphoric acid. ,, Second, these products create very thin coatings, ,, which may be oxygen inhibited, resulting in a poorly polymerized adhesive layer. Third, they are highly prone to phase separation as the solvent evaporates from the solution and finally they behave as permeable membranes after polymerization. Many authors remarked that among all the classes of dentin adhesives available, none of the contemporary one-step self-etch systems could compete with more traditional multi-step adhesives. Thus, the objective of this study is to evaluate the marginal adaptation of self-etch adhesives with two alternative modes of application (double coat and placement of a hydrophobic resin coat) and compare them with the manufacturer's directions. This study tested the null hypothesis that there is no effect of double- application or the application of hydrophobic layer on marginal permeability of one-step self-etch adhesives. Four one step self- etch adhesive systems XENO-III (XE,denstply de trey, konstanz, Germany), ALL-BOND SE (Bisco, inc, Schaumburg, U.S.A), CLEARFILTRI-SBOND (Kuraray medicals), FUTURABOND NR (Voco,Cuxhaven, Germany) and Filtek TM Z250 (3M ESPE) hybrid composite material were used. Sixty intact caries- free human premolar extracted for orthodontic purpose were selected. Any extrinsic stains or calculus deposits on teeth were cleaned using ultrasonic scaler and specimens were stored in isotonic saline until used. Class V cavity with a dimension of 3mm incisogingivally, 3mm mesiodistally and 1.5 mm depth was prepared on both buccal and lingual surfaces of all teeth for total of 120 cavities . The preparations were made with no 245 carbide bur in high- speed, under copious water coolant. After every 5 preparation, the bur was discarded and replaced with new one. The enamel margins were given 0.5mm bevel at 45 0 angle by using tapered fissure bur. 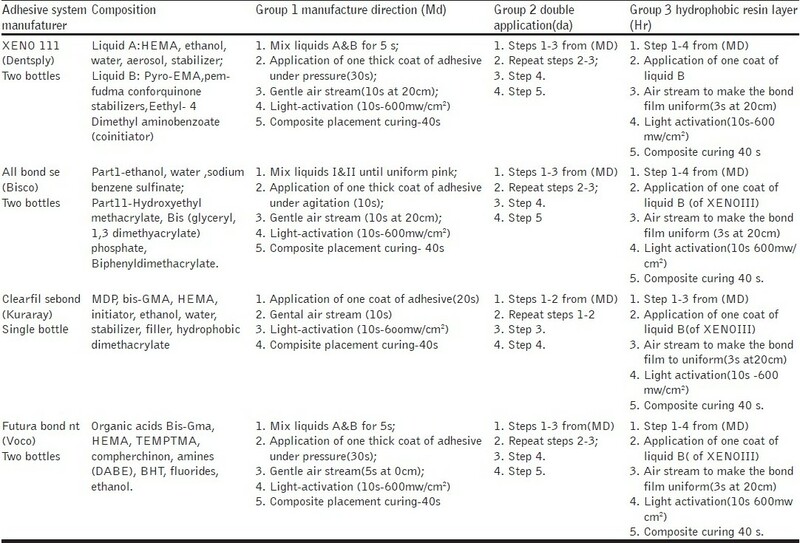 The specimens were randomly and equally assigned to 3 experimental groups (n=10) for each of "all in one" adhesives, as shown in [Table 1]. Adhesive systems, composition and application modes of different groups are described in [Table 2]. The restored specimens were stored in distilled water for 10 days. Then specimens were thermocycled for 1,000 cycles at 5º ± 1º and 55º ±1º with 30 sec of dwell time. 0-No dye penetration; 1-Dye penetration up to half of the cavity depth; 2- Dye penetration more than the half of the cavity depth, but not extending the axial wall; 3- Dye penetration arriving to the cavity floor/axial wall and beyond. The data were analyzed using non- parametric Kruskal-Wallis (P<0.05) and Mann-Whitney test (P<0.05) in SPSS 15 software package. [Table 3] shows the mean scores of microleakage of Xeno III, All Bond SE, Clearfil tri-s bond, Futurabond NR. Group 3, in which the adhesive systems were coated with hydrophobic layer, showed significantly decreased microleakage, then the Group 1 and Group 2 for all the adhesive systems. And there is no significant difference between group 1 and group 2 and group 3 for all other adhesives except for Xeno 111. For Xeno 111, Group 3 showed significantly decreased microleakage than Group 2. Numerous studies are evident as regards to shear bond strength and microleakage, which being the two characteristics of adhesives that are frequently evaluated in vitro studies of dentin bonding systems. In this study, dye microleakage method was employed to test the performance of self-etch adhesives under different mode of application. Several mechanisms could account for the better performance of double application. As the first layers of the adhesive begins to etch the dentin substrate, it might become rapidly buffered by the hydroxyapatite,  so that the additional layers of unpolymerized acidic monomers may improve the etching ability of these adhesives by increasing the concentration of acidic reagents. Simultaneously to this process, more impregnation of resin might occur by additional supply of adhesive resin, as hypothesized by Ito et al. When comparing the adhesive systems that were applied according to manufacturer's recommendation, the marginal adaptation of all the adhesive systems was significantly improved in samples in which additional hydrophobic layer was applied. Several mechanisms could account for the better performance of this group. This finding is in accordance with the study conducted by Pashley and others; they found higher μTBS for Adper Prompt when a second adhesive layer was applied, followed by polymerization of the first layer. The author observed that an additional application of the bonding agent could seal the non- polymerized layer oxygen, thus enabling it to be adequately polymerized. The additional hydrophobic layer must have increased the concentration of the hydrophobic monomer, reducing the relative concentration of solvents and hydrophilic monomers within the adhesive interface, ,, thus reducing the intrinsic permeability of these one step self-etching adhesives. Both the double application and the use of hydrophobic layer coating allowed the achievement of higher or at least equal performance of adhesives than the manufacturer's direction. In other words, this means that no detrimental effect is to be observed when these techniques are used regardless the adhesive systems. Therefore, the null-hypothesis has to be rejected. Within the limitation of this study, it can be concluded that the marginal permeability of one-step adhesives can be minimized by the application of more hydrophobic resin. 1. Davidson CL, De Gee AJ, Feilzer AJ. The competition between the composite dentin bond strength and polymerization contraction stress. J Dent Res 1994;63:1396-99. 2. Feilzer AJ, De Gee AJ, Davidson CL. Setting stresses in composite resin in relation to configuration of the restoration. J Dent Res 1987;66:1636-9. 3. Van Meerbeek B, Van Landuyt K, DE Munck J, Hashimoto M, Peumans M, Lambrechts P, et al. Technique-sensitivity of con temporary adhesives. Dent Mater J 2005;24:1-3. 4. Van Meerbeek B, De Munck J, Yoshida Y, Inoue S, Vargas M, Vijay P, et al. Bounocore memorial lecture: Adhesion to enamel and dentin current status and future challenges. Oper Dent 2003;28:215-35. 5. Nakabayashi N, Saimi Y. Bonding to intact dentin. J Dent Res 1996;75:1706-15. 6. Perdigaw J, Geraldeli S. Bonding characteristics of self- etching adhesives to intact versus prepared enamel. J Esthet Restor Dent 2003;15910:32-42. 7. Miguez PA, Castro PS, Nunes MF, Walter R, Pereira PN. Effect of acid etching on enamel bond of two self-etching systems. J Adhes Dent 2003;5:107-12. 8. Moura SK, Pelizzaro A, Dal Bianco K, de Goes MF, Loguercio AD, Reis A, et al. Dose the acidity of self -etching primes affect bond strength and surface morphology of enamel. J Adhes Dent 2006;8:75-83. 9. Frankenberger R, Perdigao J , Rosa BT, Lopes M. No- bottle vs. Multi bottle dentin adhesives- a micro tensile bond strength and morphological study. Dent Mater 2001;17:373-80. 10. Pashley EL, Agee KA, Pashley DH, Tay FR. Effects of one verses two application of an unfilled, all-in-one adhesive on dentine bonding. J Dent 2002;30:83-90. 11. Ito S, Tay FR, Hashinomoto M, Yoshiyama M, SaitoT, Brackett WW, et al. Effects of multiple coating of two all-in-one adhesives on dentin bonding. J Adhes Dent 2005;7:133-41. 12. Rueggeberg FA, Margeson DH. The effect of oxygen inhibition on an unfilled/ filled composite system. J Dent Res 1990;69:1652-8. 13. Van Landuyt KL, de munck J, Snauwaert J, Coutinho E, Poitevin A, Yoshida Y, et al. Monomer -solvent phase separation in one-step self- etch adhesives. J Dent Res 2005;8:183-8. 14. Silveira de Araújo C, Incerti da Silva T, Ogliari FA, Meireles SS, Piva E, Demarco FF. Microleakage of seven adhesive systems in enamel and dentin. J Contemp Dent Pract 2006;7:26-33. 15. Kidd EM. Microleakage: A review. J Dent 1976;4:199-206. 16. Yoshikawa T, Sano H, Burrow MF, Tagami J, Pashley DH. Effect of dentin depth and cavity configuration on bond strength. J Dent Res 1999;78:898-905. 17. Kantona TR, Winkler MM. Stress analysis of a bulk-filled Class V light-cured composite restoration. J Dent Res 1994;73:1470-7. 18. Reis A, Albuquerque M, Pegoraro M, Mattei G, Bauer JR, Grande RH, et al. Can be durability of one -step self-etch adhesives be improved by double application or by an extra layer of hydrophobic resin? J Dent 2008;36 309-15. 19. Hashimoto M, Sono H, Yoshida E, Hori M, Kaga M, Oguchi H, et al. Effect of multiple adhesive coating on dentin bonding. Oper Dent 2004;29:416-23. 20. Camps J, Pashley DH. Buffering action of human dentin in vitro. J Adhes Dent 2000;2:39-50. 21. Brackett WW, Ito S, Tay FR, Haisch LD, Pashley DH. Micro tensile dentin bond strength of self-etching resins: Effect of a hydrophobic layer. Oper Dent 2005;30:733-8. 22. Pashley EL, Agee KA, Pashley DH, Tay FR. Effect of one versus two applications of an unfilled, all-in-one adhesive on dentine bonding. J Dent 2002;3:83-90. 23. King NM, Tay FR, Pashley DH, Hashimoto M, Ito S, Bbrackett WW, et al. Conversion of one step to two-step self-etch adhesives for improved efficacy and extended application. Am J Dent 2005;18:126-34. 24. Brackett WW, Ito S, Tay FR, Haisch ID, Pashley DH. Microtensile dentin bond strength of self-etching resins: Effects of a hydrophobic layer. Oper Dent 2005;30:733-8. 25. Albuquerque M, Pegoraro M, Matti G, Reis A Loguercio AD. Effect of double-application or the application of a hydrophobic layer for improved efficacy of one-step self-etch systems in enamel and dentin. Oper Dent 2008;33,564-70. 26. Tay FR, Pashley DH. Have dentine adhesives become too hydrophilic? J Can Dent Assoc (Tor) 2003;69:726-31. 27. Tay FR, Pashley DH, Suh BI, Carvaiho RM, Itthagarun A. Single step adhesives are permeable membranes. J Dent 2002;30:371-82. 28. Tay FR, Pashley DH. Water treeing - a potential mechanism for degradation of dentin adhesives. Am J Dent 2003;16:6-12. 29. Jacobsen T, Soderholm KJ. Some effects of water on dentin bonding. Dent Mater 1995;11:132-6. 30. Tay FR, Pashley DH, Yoshigama M. Two modes of Nanoleakage expression in single step adhesives. J Dent Res 2002;81:472-6. 31. Choi KK, Condon JR, Ferracicane JL. The effects of adhesive thickness on polymerization contraction stress of composite. J Dent Res 2000;79:812-7.